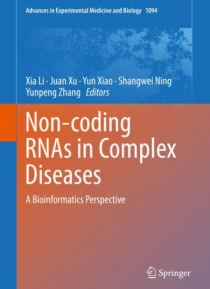 This book offers an in-depth and comprehensive review on current understanding of regulatory ncRNAs in complex diseases from a view of bioinformatics. It conveys state-of-the-art bioinformatics tools and methods for ncRNAs from computational detection, functional prediction, to their roles in diseases. Computational methods used to investigate uncharacterised ncRNAs in diseases are mainly summariz… ed in seven aspects: DNA variation of ncRNAs in diseases, prioritization of disease-related ncRNAs, dysregulation epigenetic factors that regulate ncRNA misexpression (DNA methylation and histone-modification), complex crosstalk across ncRNAs, ncRNAs acted as competing regulators to mediate the expression of protein-coding genes, non-coding RNAs mediated risk pathways,and their contributions to drug target predictions. The generally used data resources of ncRNAs are also listed in the end. This book provides important information on the current progress in the fast-moving fields of bioinformatics for regulatory ncRNAs. It provides a timely and useful reference for computational biologists, specifically with RNA interests, and other related areas.Prof. Xia Li is a Professor and the Dean of College of Bioinformatics Science and Technology, Harbin Medical University, China. Dr. Yun Xiao, Dr. Juan Xu, Dr. Shangwei Ning and Dr. Yunpeng Zhang are from College of Bioinformatics Science and Technology, Harbin Medical University, China.